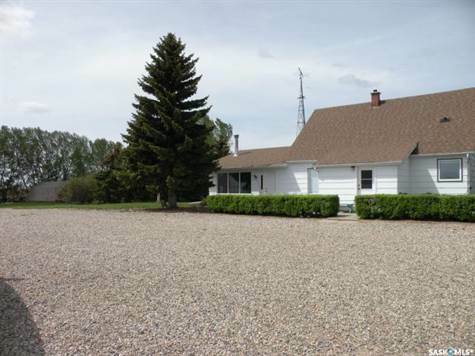 Garage: "Garage: 2 Car Detached, Covered; Parking Space(s): 4"
Lot Size: 16.73acres n/a "Irregular"
Very well located property just off #11 divided highway and 50 miles from Saskatoon and not far to Davidson. This 3 bedroom house also has 2 bathrooms open kitchen and dinning room and large family room with a wood burning fire place. This property has a detached garage 26'x30' wired for 220 and 2 over head doors insulated + 50'x80' steel Quonset and a 26'x50' wood Quonset, + other wood buildings and corrals with a pasture fenced in. The property is on a good grid road and well treed in.